554 pages | 8 B/W Illus. ‘This wide-ranging volume from an expert team is an outstanding contribution to the understanding of our European neighbourhood. It covers the range of countries and issues in depth with thoughtful insights into the many policy challenges for the European Union, not least for its foreign policy and role in conflict management.’ - Helen Wallace, University of Sussex, UK. ‘A most indispensable reading for all those who wish to know more about one of the central features of EU foreign policy. 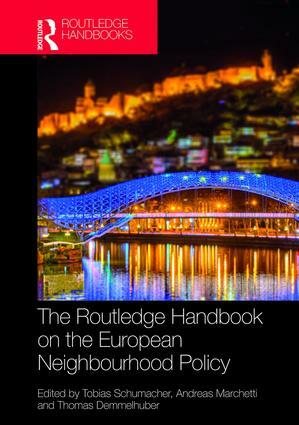 At a time when the EU neighbourhood in both its Eastern and Southern dimensions is on fire and facing unprecedented challenges, this handbook offers the necessary keys to better understand Europe's policy in this field for the last ten years. It also helps to grasp the essential ingredients that will shape its future as Europe is struggling to stabilise its highly volatile fringes.’ - H.E. Ambassador Pierre Vimont, Carnegie Europe, and former Secretary General, European External Action Service. "… A captivating collection of chapters and a wide-ranging account of the ENP… An excellent reference book for all students of the ENP and a very ambitious and urgent policy agenda for ENP practitioners." - Tatiana Skripka, Maastricht University, Netherlands, Book Review in the Journal of Common Market Studies, 2018 Vol. 56 (7), pp. 1675-1683. Tobias Schumacher isthe Chairholder of the European Neighbourhood Policy Chair at the College of Europe, Natolin, Poland. He is also an Associate Senior Research Fellow at the Centre for International Studies (CEI-IUL) at the University Institute of Lisbon, Portugal. Andreas Marchetti is a Senior Fellow at the Center for European Integration Studies (ZEI) at the University of Bonn, Germany. He is also Founder and Director of politglott GmbH. Thomas Demmelhuber is Professor of Middle East Politics and Society in the Department of Political Science at the Friedrich-Alexander-University of Erlangen-Nuremberg, Germany, and since 2015 he has been Visiting Professor at the College of Europe, Natolin, Poland.